It was a gorgeous day for a run on Saturday morning. Then again, it is on most weekends in Hawaii. 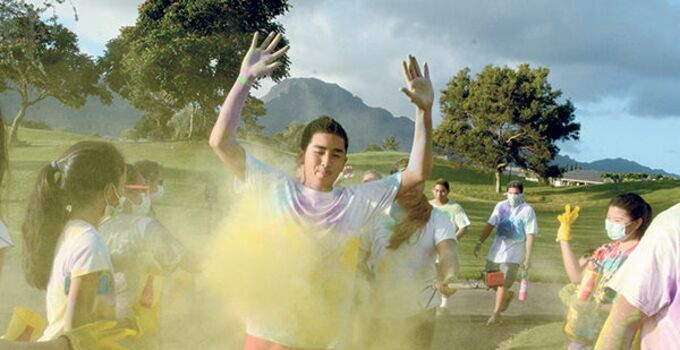 That made for perfect conditions for the second Color Run Extravaganza at Puakea Golf Course. According to The Garden Island, approximately 75 participants either ran, walked or both around the cart paths at the 18-hole facility, which routes around mountains, ravines and offers stunning views of the Pacific Ocean on five holes. For three miles, participants ran a course where, at certain checkpoints, volunteers splashed the prepared runners with colored corn starch. The event was a fundraiser for the Kapaa Middle School Choir and Ukulele Band. Students in the band will use the funds in traveling to Anaheim, California, to perform in the Heritage Music Festival in March 2015.